Courtesy photo Blimey mates, we have a bundle of Australia right here in Urbana, Ohio. 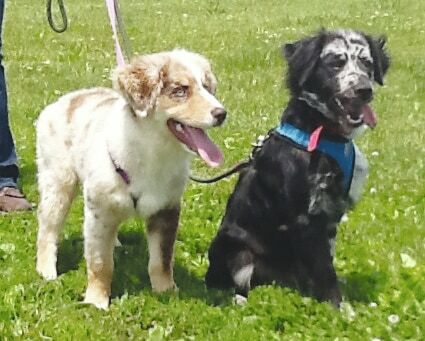 Zagros is a beautiful red merle and Archer is a handsome black and white merle, both Australian Shepherds. Zagros and Archer are both 5 months old and have been neutered, heart-worm tested, wormed and up to date on all vaccinations including flea and tick prevention as well as heart worm preventative. These are high energy boys who need room to play and owners who understand the energy level of an Aussie pup. Both fellas are good with other dogs and are great around children. They will play with a cat, but neither have the prey drive to harm one. Please visit our website at www.barelyusedpets.com. Also “like” us on Facebook to see our new arrivals and adoption match-ups. For a complete listing of available pets, please check us out on petfinder.com. Barely Used Pets is located at 2790 E. US HWY 36, Urbana, OH, or you may call us at 937-869-8090. Come out to visit Zagros and Archer or any of our available pets. Blimey mates, we have a bundle of Australia right here in Urbana, Ohio. Zagros is a beautiful red merle and Archer is a handsome black and white merle, both Australian Shepherds. Zagros and Archer are both 5 months old and have been neutered, heart-worm tested, wormed and up to date on all vaccinations including flea and tick prevention as well as heart worm preventative. These are high energy boys who need room to play and owners who understand the energy level of an Aussie pup. Both fellas are good with other dogs and are great around children. They will play with a cat, but neither have the prey drive to harm one. Please visit our website at www.barelyusedpets.com. Also “like” us on Facebook to see our new arrivals and adoption match-ups. For a complete listing of available pets, please check us out on petfinder.com. Barely Used Pets is located at 2790 E. US HWY 36, Urbana, OH, or you may call us at 937-869-8090. Come out to visit Zagros and Archer or any of our available pets.